From June of 1783 until February of 1784, the Laki volcano in south-central Iceland spewed an estimated 122 million metric tons of sulfur dioxide gas into the sky — slightly more than industrial activity today produces in an entire year, says this article by Sid Perkins. In the two years following the Laki eruption, approximately 10,000 Icelanders died — about one-fifth of the population — along with nearly three-quarters of the island’s livestock. Then the cloud spread, killing an estimated 23,000 people in Britain alone. Using computer simulations, Anja Schmidt, an atmospheric scientist at the University of Leeds in the U.K., and her colleagues modeled how such an eruption might affect the Europe of today (published yesterday in the Proceedings of the National Academy of Sciences). In the first three months following the hypothetical eruption, their studies showed that the average aerosol concentration over Iceland and northwestern Europe would more than triple, while in southern Europe aerosol concentrations would rise by 60 percent. During the ensuing year, “the increased air pollution swept from Iceland to Europe would cause massive amounts of heart and lung disease, killing an estimated 142,000 people” – perhaps as many as 228,000. A Laki-sized eruption would have a huge impact on crop yields and, by affecting shipping and air traffic (it could ground air traffic for 6 months or more), would also affect Europeans’ ability to import food, says Alan Robock, an atmospheric scientist at Rutgers University in New Brunswick, New Jersey. If such an eruption would kill hundreds of thousands of people, who can take steps to protect themselves, just imagine what would happen to the animals, who have no clue as to what is happening. Food. Food. Food. Stock up on food. Ehhh…this is leaning on the side of alarmism here, and I thought that’s what this website was against. Roy, when you look at something trivial and try to make something Earthshaking out of it, that is alarmism. When you take the past and project it to the present or near future, especially when you are talking about a recurring incident, that isn’t alarmism, that is trying to wake up the masses to what WILL happen. Although this does involve computer modeling, the factors being modeled aren’t specifically difficult to model. We are not talking about 200 or more forgotten influences as was done with the AGW scam. A warning IS an alarm, I suppose, but we are talking about reality, just as when we discuss the super volcano potentials, the next “big one” for California, or the next Richter 9 on the ring of fire, we only know that it will happen, we can’t tell when, just try to be prepared in case it does happen in your lifetime. “Alarmism” ? Well in my opinion the threat to life possed by the Icelandic volcanic activity is such that we do need to ring the alarm bell. Unless we ring the alarm bell no one will be in a position to make preparations. Obviously the alarm bell is necessary. It exists for a reason. I say use it. Ding a ling a ling a ling ! Is this just info?? Or is a eruption coming?? It’s safe to say one is coming, just we don’t know when; it’s likely about due. Considering that we appear to be in a tectonically active period, sooner seems likely. We don’t know enough for greater detail at present. Preparedness and contingency planning are well advised. In brief, I wouldn’t mind a week’s vacation in Iceland but I certainly wouldn’t move there. Eruptions do provide some warning. If rescuers coordinate, humankind may revive truce and mutul-aid to AVERT next ice age! High magma activity has been forecasted by ancient Greek Antikythera computer: it computed the planets’ positions that control the galactic electricity (GE=Heraclitus thunderbolt) flow to the Earth: http://www.fourmilab.ch/cgi-bin/Solar. – Galaxy emitting center to the south of the plan. Mainly this electricity direction and Jupiter’s 12 year orbit control 12 year sunspot cycle. Now it’s Pluto that cuts GE to the Sun and it spreads to the planets, raising quakes and volcanic activity as happened in 1815 and during most of the Little Ice Age. The main factor is the DENSITY of the galactic cloud (‘Fluff’) where we travel this era: http://antwrp.gsfc.nasa.gov/apod/ap020210.html. 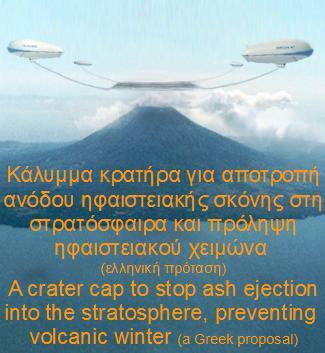 We immediately must test the proposal to AVERT volcanic winter through crater-caps/grids hold by zeppelins over extra active volcanoes to prevent ash ejection to the stratosphere: the begining of every ice age. Arrogant enemies of Autarky, pharaos, Romans, Mayas, Aztecs, Incas etc COLLAPSED because of their babylons’ famine in volcanic winters. Why are people so ignorant. how would a atmospheric eruption like this stop Europe from importing food? Are people so stupid as to think food comes in airplanes. Food arrives in Europe from the sea. Every day large Ships over 300,000 tones or more bring grain, rice, meat, molasses, fruit, vegetables, you name it it comes into the ports around europe. The only good shipped by air are soft fruits with short sheflf life. but you can also find these products coming on ships. Mail also comes by plane. The world wouild not end if planes stopped this afternoon. it would just take longer to travel. Nearly all the uks meat and dairy was shipped from the other side of the world less than 50 years ago. Its just that now as a island nation we relay on Indian, Phillapino and eastern european seamen, rather than having our own pool. That now stands at less than 21000. most of them on cruise ships. I can’t see why they factor no air supply for food etc. like ANY people anywhere in the world, living in quake/volcanic zones, it would be common sense( rare I know:-) to have at least a months food and water stored if at all possible. always have some back up stored animal fodder. most farms would have had in times past. some bandages and other first aid, and a bug out bag. Media is able to “by the second” follow almost anywhere ,inform us of disasters. once, it took many days for the worst, and ended up as a 5 line snip in world news sections. no scale or in your face truths. Why? is there such a common example of complacency over personal survival so prevalent. WE, not govt or services ARE responsible to help ourselves survive and not be a burden to overstretched resources. or are we perfect citizens in Nanny states, where big brother tells us what to do, after TSHTF? The real hazzard apart from ash and suphuric and flouride gases is the effect such gases and particulates will have on the climate in respect to agriculture and the general drop in the temperature. Drought, crop failure and famine is a real possibility. The Laki Eruption had global effects on climate and food production.